Wendell Smallwood helped himself a bit on Thursday. 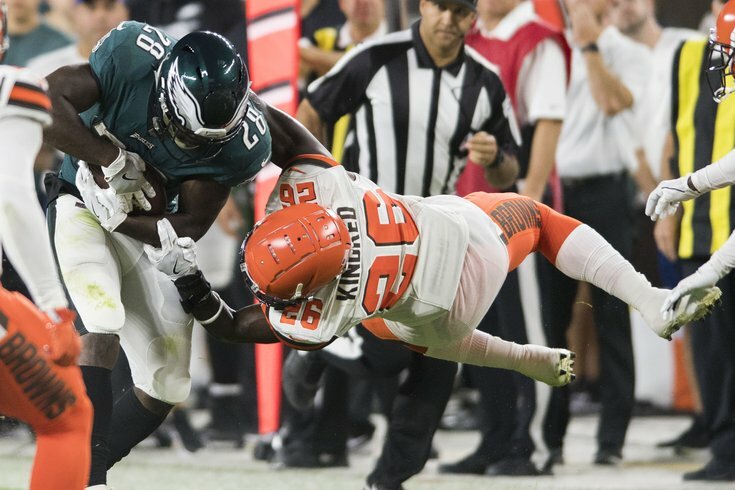 With the Philadelphia Eagles having played their third preseason game, let's take a look at the top five notable roster spots that may or may not still be up for grabs, and where I see the Eagles leaning. In something of a minor surprise move, Jim Schwartz had Kamu Grugier-Hill working with the first-team defense against the Browns. Nate Gerry had previously gotten the nod there in the first two preseason games. Grugier-Hill has more athleticism and upside than Gerry, but it seems like Schwartz likes Gerry's ability to grasp the mental side of the game, having learned all three linebacker positions. If I'm Schwartz, Grugier-Hill is my "starting" WILL linebacker, and Gerry's versatility makes me feel comfortable using him as a depth player. Corey Nelson isn't even in the conversation to make the team at this point, in my view. Keep one of Wendell Smallwood, Matt Jones, Josh Adams, or Donnel Pumphrey: In this case, forget about Jones or Pumphrey. Jones can't hold onto the football whether someone has thrown it to him, or if he's already carrying it. Meanwhile, Pumphrey can't stay on the field, and hasn't done much when he has. Keep two of the above backs, and thus, five total: I don't why you'd keep two of the above backs, when it's debatable whether even one deserves to be on the roster. Just keep three running backs: The logic here would be that they're probably only going to have three backs active on game day anyway, so why keep more than three if nobody has definitively won that job? Sign someone else's running back off of waivers after 53-man cutdowns: This sounds like a good idea in theory, but the Eagles won the Super Bowl, meaning they'll be last in waiver wire priority. If I were the Eagles, Josh Adams has shown me enough to give him a roster spot on the 53. If the Eagles were really cutting a guy at some other position who is worth keeping to make way for Adams, then I would perhaps be tempted to try to get Adams on the practice squad, but when you take a look at the bubble guys, the Eagles really aren't rolling that deep. Schwartz said that the third preseason game would go a long way toward determining who would be the slot corner. I'd have to go back and re-watch it with the benefit of seeing plays multiple times, but watching live, it seemed like Sidney Jones did a nice job in coverage while working with the first team defense. Meanwhile, Avonte Maddox got something of a gift interception in the second half that he almost returned for a touchdown. I think it would be a major upset if Maddox beat out Jones for a larger role on this team, and I'm not ready to take Jones out of the overwhelming lead there. It will be interesting if Jones plays next Thursday in the fourth preseason game against the Jets, but I think he has all but wrapped up this job. At wide receiver, at the start of camp, there were four locks at wide receiver. They were Alshon Jeffery, Mike Wallace, Nelson Agholor, and Mack Hollins. Since then, Shelton Gibson has very clearly played his way onto the roster as well. Kamar Aiken: I was told a couple weeks ago that the team likes him, but what exactly has he done? Marcus Wheaton: Veteran who still has some upside, but has been out for weeks with a hamstring injury. He'll have one last chance to impress next Thursday. DeAndre Carter: A late-emerging slot receiver type who has made his share of plays in the passing game, and most recently as a returner. Rashard Davis: He had a few ugly punt returns, but he has also made some big plays as a receiver. Carter is most intriguing of bunch, perhaps partly because we're just learning now what he can do. And then there's the tight end position. Zach Ertz, Dallas Goedert, and Richard Rodgers are locks, but Rodgers is presently out with a leg injury that Doug Pederson classified as the more serious "week-to-week." Will the Eagles keep an extra tight end while Rodgers recovers? If so, Josh Perkins might be a candidate for that spot, but he too has been out with a head injury. In other words, there probably two spots available for three different positions -- fourth running back, sixth wide receiver, and fourth tight end. Cameron Johnston rebounded after a bad start to camp, and has punted well in the preseason games. Against the Browns, he pinned Cleveland inside the 10 on a well placed punt toward the sideline that bounced out of bounds. His short-field punting has been better than expected, and obviously, he showed the ability to blast long punts with his 81-yarder against the Steelers. It feels a lot like Johnston is going to win this battle over his invisible competition.